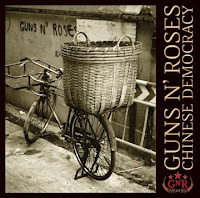 An exacting and erudite case for reconsidering Axl Rose's Chinese Democracy has just been posted over at Decibel. Author Shawn Macomber systematically debunks the mythology mucking up the album's aura and asks us to actually listen to the music. He couches refreshing insights amidst incisive snarks such as: "[Chris] Cornell hasn’t been qualified to carry Rose’s sweat-soaked bandanna since Badmotorfinger" or "Appetite for Destruction was the result of a set of very specific, unsustainable, unrepeatable circumstances. (Just ask Buckcherry.)" BURN! TWSS: The Ultimate Feminist Gag?